Back in March we had the incredible opportunity to tour Japan for 6 days and the country made a lasting impression on all of us. Never have we been so welcomed into another community or treated so hospitably. From the start, we all were blown away by the beautiful sights and culture of Japan--some of the highlights were seeing the Toyko fish market, riding on the Bullet Train to Sendai, and walking the Philosopher's Path in Kyoto with the Cherry Blossoms in full bloom. But even more so, we were overwhelmed to witness firsthand the amazing bluegrass history and community in Japan. It was inspiring to see audience members mouthing the words to old Stanley Brothers tunes that we played at our performances, or to listen to eyewitness stories of bluegrass legends coming to tour Japan in years past, and especially to hear the incredible caliber of local bluegrass musicians around the country. It felt like they all knew more about bluegrass than we did! 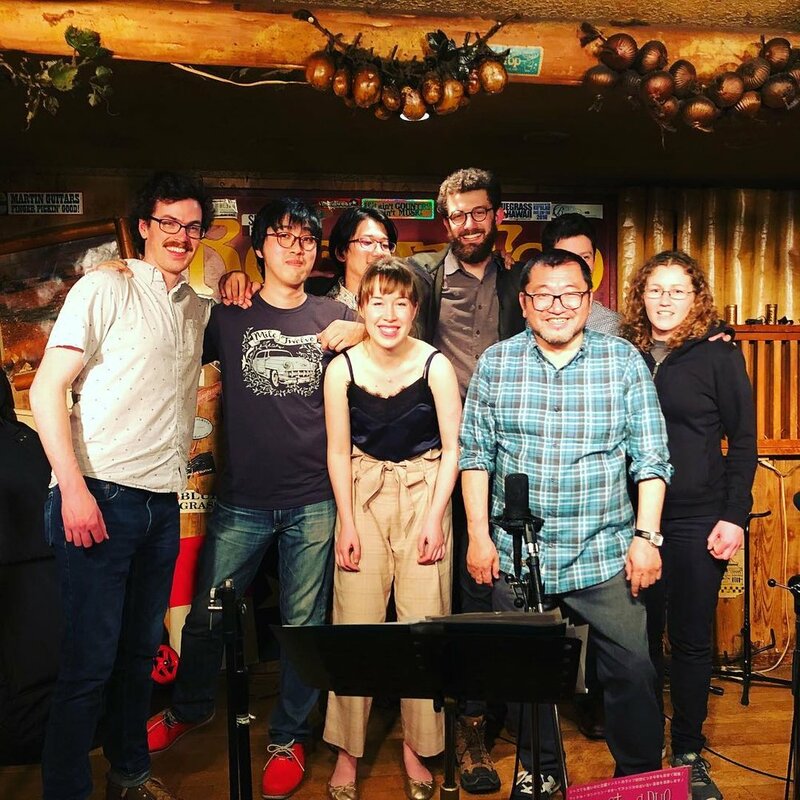 We can't thank Toshiaki Shimada enough for making this tour happen. He was delightful to work with, and we couldn't have dreamed of doing this without his vision and generous support. Also, we are so grateful for the tireless efforts of Takumi Kodera, Fumitaka Kato, and Tomoya Kawakatsu for traveling with us and making sure every detail was taken care of. We felt like we were in such good hands for the entire tour! And thanks to all of the wonderful people who came to our performances, drove us to gigs, and jammed with us after shows. It feels great knowing that we have such lovely friends on the other side of the world now. Needless to say, we are all anxious to come back. Some of us have even started to learn Japanese in anticipation of our next visit!